Barbro Nilsson Rugs Barbro Nilsson nee Lundberg (1899–1983) is one of the most renowned and respected designers and master weavers in Sweden’s mid-century handcraft Renaissance. Nilsson was immensely creative and productive as an artist. However, she was also a great leader and teacher. These talents landed her the position of artistic director at the Marta Maas-Fjetterstrom atelier after the founder’s death. Nilsson’s long and illustrious career began in the 1920’s when she created textile cartoons and immense tapestry versions of modern Swedish art by Sven Erixson and other artists who were at the forefront of the contemporary movement. Even as a weaving student in Stockholm’s famous art academies, Nilsson’s work was highly acclaimed. This recognition led to her teaching at the prestigious Konstfack, also known as the University College of Arts Crafts and Design, where she directed the textiles department from 1947 through 1957. Around the same time, Nilsson was selected by Marta Maas-Fjetterstrom to replace her as the firm’s creative leader. While Fjetterstrom was instrumental in developing a grassroots handcraft revival, Nilsson guided the firm through its most successful years from 1942 through 1970 when mid-century trends gripped the international design world. Nilsson’s original patterns and textile interpretations of great contemporary art proved her talents as a master weaver and designer. Her designs were influential, and her passion for creating radiated within her family and community of peers. Her mother was a successful painter and garden architect; she was married to a sculptor; and her son is a photographer. A number of the most iconic designs ever created by the Marta Maas-Fjetterstrom atelier are attributed to Nilsson, and her impact on Scandinavian style is undeniable. 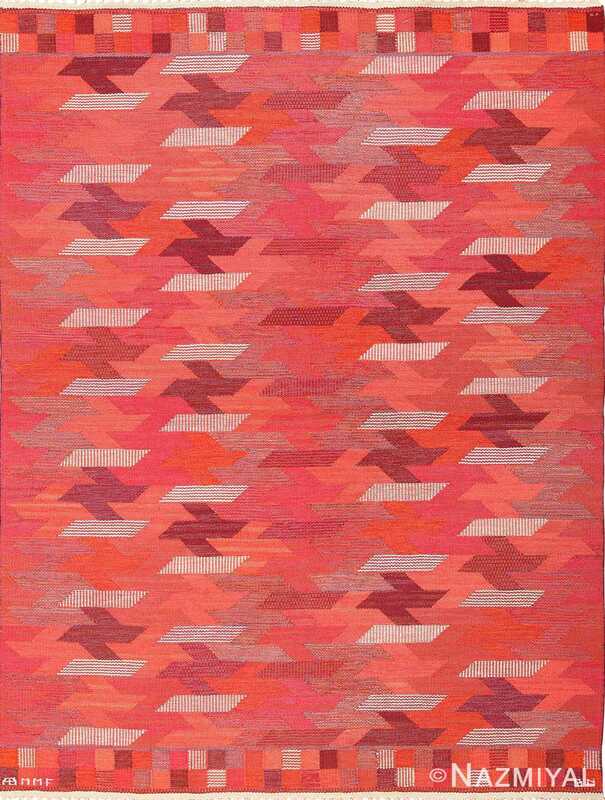 Color, personal inspiration, innovative weaving techniques and design expertise all contributed to the enduring success of Barbro Nilsson’s flat-weave carpets, tapestries and remarkable mid-century designs. Barbro Nilsson (1899-1983) was a world famous textile artist who rose to fame in Gothenburg’s new concert house in the mid-1930’s. 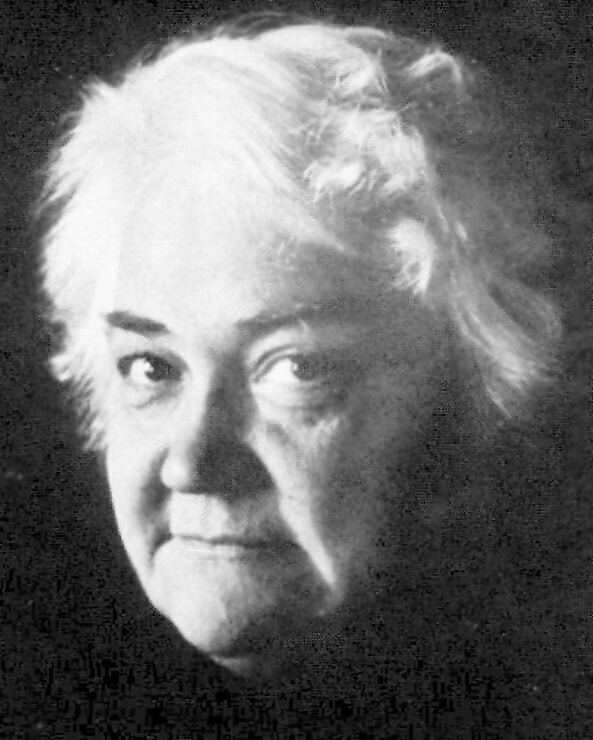 Barbro Nilsson took over Marta Maas Fjetterstrom workshop in Bastad as chief designer in 1942 after the demise of Fjetterstrom in 1941. In the same year that she took over the mantle of leadership, the studio was renamed MMF AB and became a public liability company. Shares sold by this new company attracted many influential personalities like King Gustaf V of Sweden who bought into the workshop. The firm under this new leadership experienced its most successful period (1942-70). While the grass root handicraft revival movement was developed and nurtured by Fjetterstrom, it became a huge success in the international community under the guidance of Nilsson. Before she became the chief designer of Marta Maas Fjetterstrom, Barbro Nilsson was previously the head of the textiles department at the Konsttackskolan in Stockholm in the 1950’s. 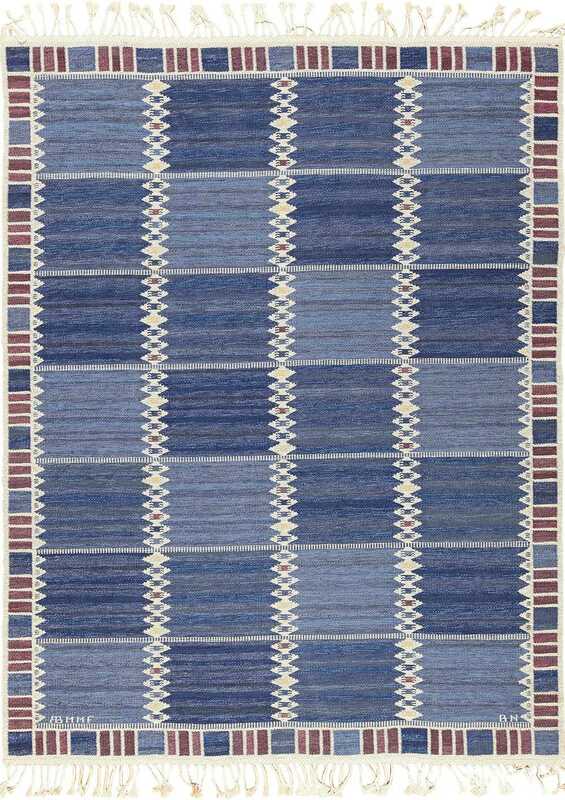 Nilsson very much toed the lined of her predecessor, Marta Maas Fjetterstrom and continued providing high quality vintage mid century rugs to companies and establishments in Sweden. 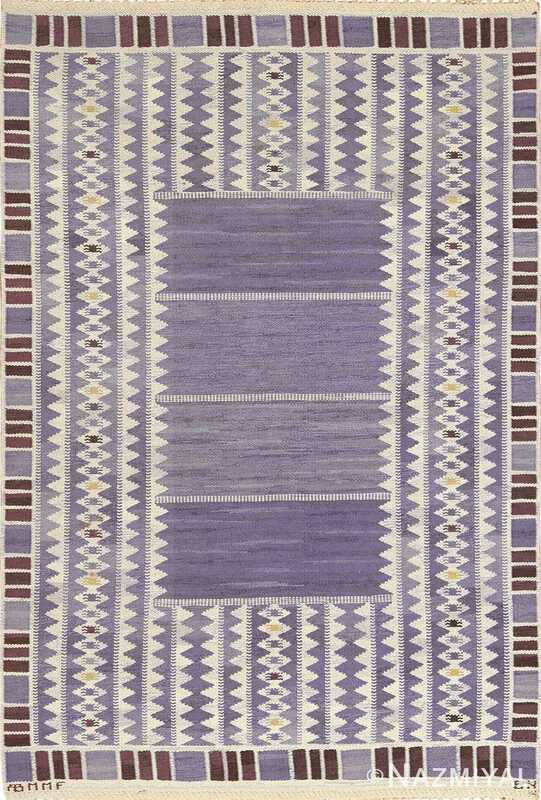 Her favorite designs were pile and flat woven Kilim rugs and she also used the tapestry technique to her advantage. 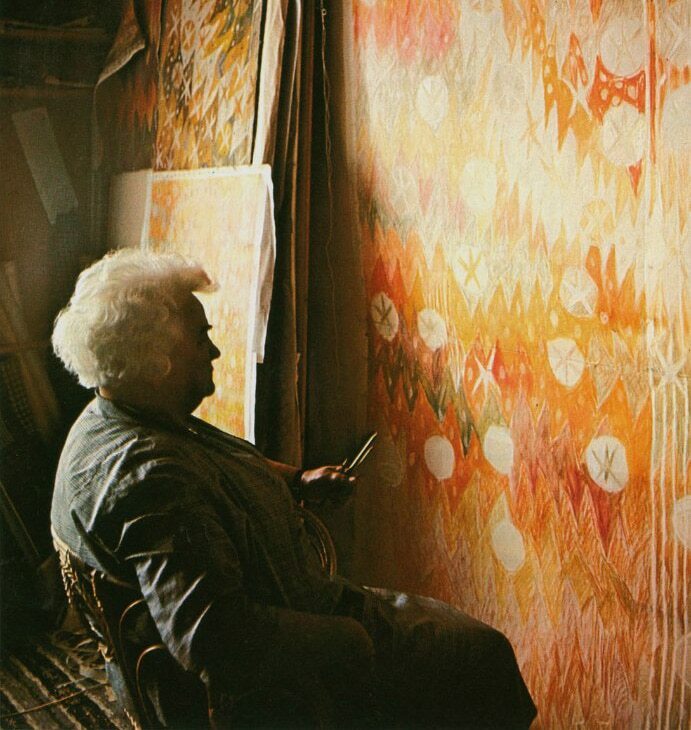 In contrast to Barbro Nilsson, Marta Maas-Fjetterstrom emphasized line over color while Nilsson on the other was an avid colorist who enlivened her Swedish rugs through the use of colors. 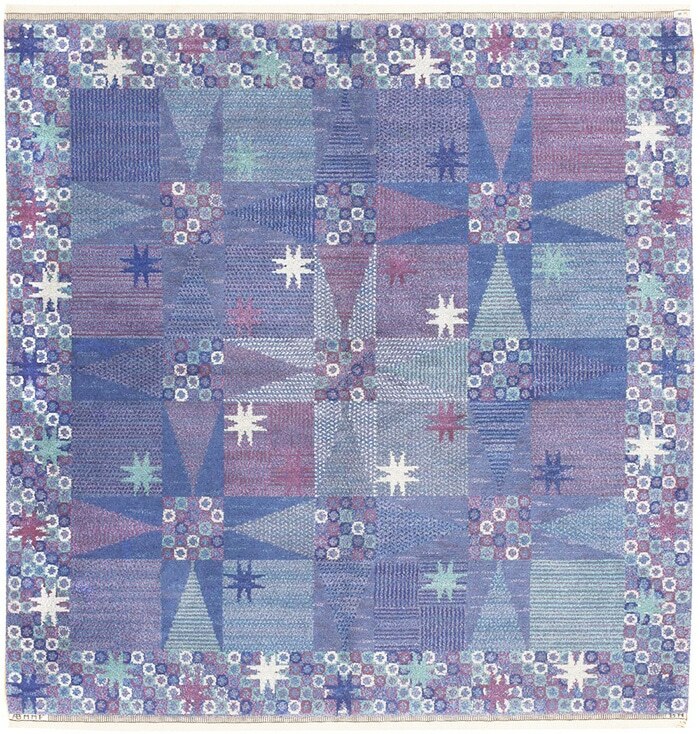 She wove the famous Salerno blue rug line design in which she exhibited her mastery of color in subtle variations of blue. The effect was a rug that was splendid and beautifully woven. 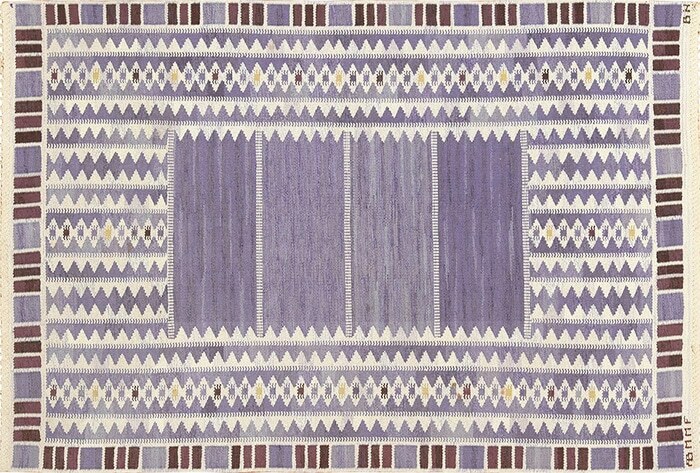 Some of her Scandinavian rugs were known to contain more than 20 color schemes. Much of her works are sought after and adorn public buildings, establishments and churches throughout the world. Inspired by nature, Nilsson incorporated stylized line and nature into her astonishing designs. 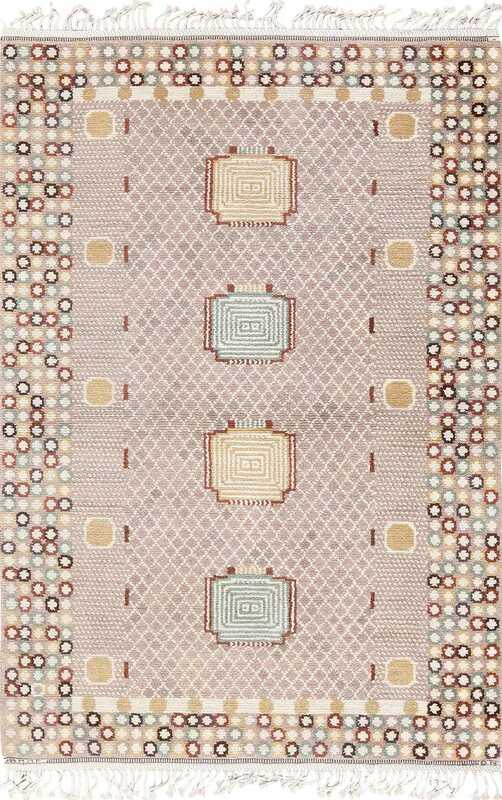 This rug article about The Iconic Swedish Textile and Scandinavian Rug Designer Barbro Nisson was published by Nazmiyal Antique Rugs. 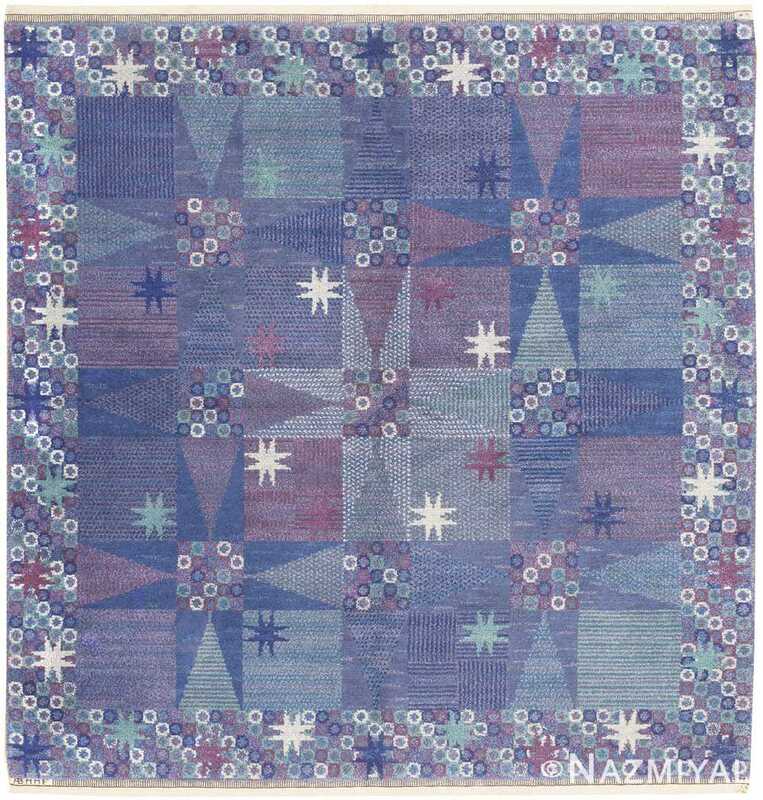 Designed by the legendary Barbro Nilsson, this vintage Scandinavian carpet features a whimsical, textural pattern of tiled stars rendered in rich maritime colors.